I adore this book. Sara, traveled all the way from Sweden to Broken Wheel Iowa just to meet her pen pal, Amy.Sara and Amy met when Amy sells Sara a book through a web site. When Sara arrives to meet her long distance friend in person, however, she finds that Amy’s funeral has just ended. The town’s people are happy to look after their tourist. Sara decides to stay in Broken Wheel in Amy’s farmhouse. She opens a bookstore in honor of her friend’s memory with her friend’s books. Sara also makes friends with the locals who all seem to accept her as one of their own. Sara wants is to share the books she loves and prove to her new friends that reading is one of the great joys of life. When Sara’s visa is about to expire the town’s residents all ask her to marry them and they concoct a scheme to keep Sara in Iowa.This is a warm cordial agreeable book. It is full of quirky people with good hearts. We get to meet the locals and get history of the town, Broken Wheel. It has a feel of classic small town America. 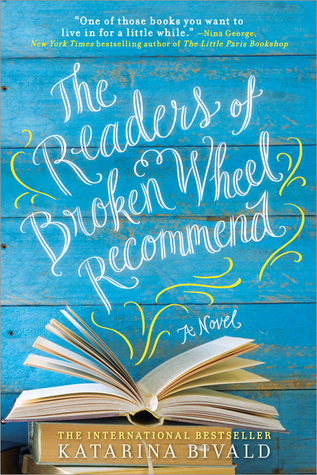 I fell in love with Broken Wheel and its inhabitants just the way Sara did. The only disappointment is when the story comes to a close. You will be reluctant to leave Sara and the town of Broken Wheel as I was. 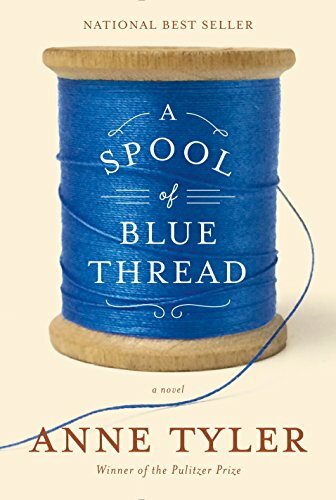 I would call A Spool of Blue Thread an “in-between” novel or book. It is one of those books that don’t tax your brain with murderous clues or puzzles to figure out. It may cause some emotional responses for some people, though it didn’t really for me, but not the weeping sort that hang with you days after you stop reading it. No, this book sort of meanders along like a lazy river in the summer. It babbles and turns slow and steady with no real rapids or speedy currents to contend with along the way. Tyler tells us the stories of real people, a real family, real life. In this book, we meet the Whitshanks. Abby and Red have raised four children in their family home in Baltimore. As they grow older, their children deal with old family issues and changing roles. The second half of the book flashes back to Abby and Red’s younger days, as well as to their parents’ early relationships. This pleasant novel that is perfect for a break between crime drama, adventure thrillers and tear jerking romances. I adored this book with its mix of truth and fiction. It is an account of Carrie McGavock, who finds her home taken over by the Confederate army and turned into a field hospital during the battle of Franklin, Tennessee. 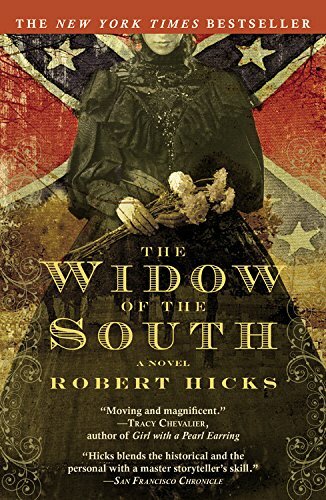 She is called the Widow of the South. She did amazing things for nearly 1,500 Confederate soldiers killed in the Battle of Franklin. She nursed them while they were dying, and reburied them on her own land when the mass grave field they were buried in was to be plowed. She kept records for every one of them and wrote to their families about their lost loved ones. The cemetery that she protected for them still exists and is kept up by The United Daughters of the Confederacy. The stories are told with stark honesty, not romanticizing the battle. The straightforward delivery, while at times gruesome in its descriptions, adds realism, and yet poignancy, to horrible situations. The fictional parts come in with her fascination with an injured young Southern soldier who is wounded when he releases his guns and charges forward into Yankee territory, holding only the flag of his company’s colours. Carrie sees something kindred in the man’s eyes and falls in love with him. He does not coddle her or treat her with the social propriety. He eventually recognizes the fact that she is as injured as he is, even though her injuries are emotional and well-hidden. Together, they are able to heal each other’s physical and spiritual wounds, finding a love that it endures across the decades and miles of separation. Why I Threw out my TBR List…Sort of…. A librarian without a To Be Read list full of books is unheard of where I live. A bibliophile without a stack of TBR books and a list of recommendations of well over one hundred books is a myth. That person exists where the unicorns live. I have a TBR list of about 265 books. I also have four stacks of books on the floor of my home library, two small stacks in the living room and a medium size stack on my nightstand. I will die before I read all my TBR books in all those locations. I thought about the fact that every day I add to my list or a buy more books. I felt more and more insane at the thought of how I would possibly read all the books I own, much less manage to read through the list I have too. I guess I could weed the list. Maybe cut it down to manageable chunks of books. I could even categorize them and tackle the most loved and desired first. The amount of the time and work this would take was a daunting thought. Then it hit me, just get rid of the list and read the first thing that I grab. Read what speaks to me at that moment in that moment. So I was looking at the list. Staring it down like one does a spider you are about to smack with a shoe. It was glaring back with its catchy titles, best seller snobbery and award-winning charmers. As I went to delete the list, I could not do it. I was thinking, what if a person recommends a book and I remember it is on my list. I may need the list to jog my memory. Do I own it? Is it at the library? What was that title? Was it the one with the blue cover? Deleting the list would not work for me. I think I actually saw my list give a smug smile of victory. 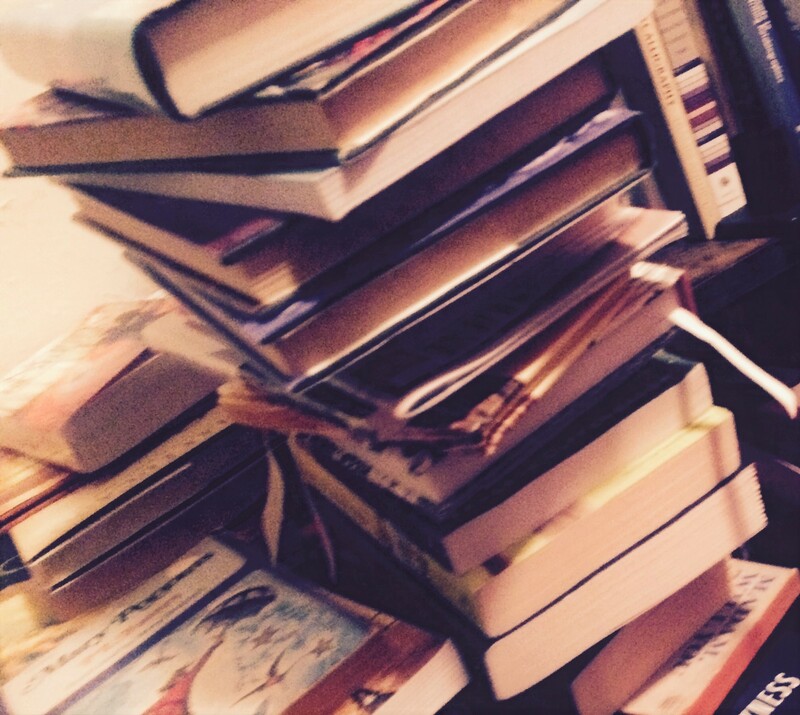 I came to the conclusion that I would not be a slave to the TBR list. I will use it for inspiration, but not as a dictator that will force me to read things I may change my mind about reading. My list did not own me, so I consciously changed my thoughts about my TBR list. As a result, I feel free to read things I pick up at random. I don’t have to check the list to get permission to read it. I do not feel compelled to check the reviews before I read it. I just pick it up buy it or check it out from the library. Then I unapologetically read the book. I do not feel obligated to write down every title someone passionately suggest even if they say I must read the latest book they can’t stop talking about. If it sounds interesting and I see it, I can pick it up or not. I am not obligated to consult the authority of the list. I am no longer a captive of the TBR list. I am a free reader. I absolutely adored this book. It is layers of romance with a side of yummy topped with a sprinkle of mystery. 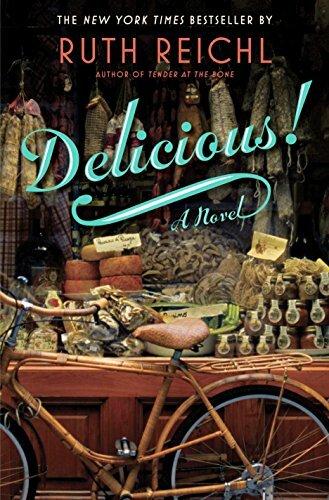 Billie Breslin leaves her family, moves to New York for a career as an assistant to the editor of Delicious a long standing well loved food magazine. She is swept up in the Greenwich Village food community. A deli proprietor and his family accept her as one of their own. When the magazine ceases publication she is retained to answer complaint letters by maintaining the magazine’s satisfaction guarantee. That is every recipe a success or you get a refund. Being in the building alone, after the other staff members have left, she stumbles on a hidden library and discovers a series of letters between a previous Chef contributor employed by the magazine and a 12-year-old girl during World War II. Normally I’m not fond of books in which part of the story takes place in letters, but I found the letters from Lulu to James Beard to be charming. Billie falls in love with the story of the girl and she falls in love with an architect historian who is hired to appraise the magazine’s office building that is actually an old federal mansion. There is so much more to this story that I feel I can’t share for fear of ruining it for you, dear reader. Please do not listen to the negative reviews of this book and read it. I almost missed this sweet story because of reviews I read. I am thankful I took a chance and experienced the deliciousness of it all for myself. I finally got to finish this wonderful read. It was as good as the first two in the series. 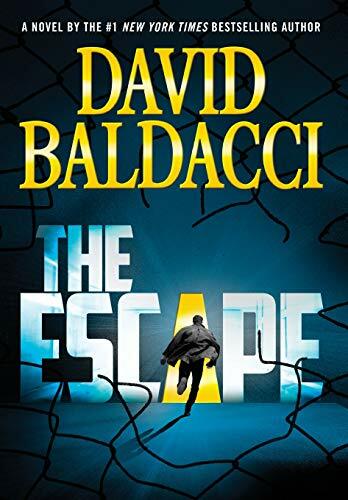 In the Escape we learn why Robert is in prison. We learn more about John Puller and his relationship with his family. This is a must read if you read Zero Day and The Forgotten. You have to finish the story. This biggest lesson of this book, things are not always as they seem and trust is a fragile thing. There really isn’t a whole lot more I can say other than READ IT! We are at day eighteen of NaNoWriMo, just a bit past halfway. I’m working through a quandary. I appear to have two stories going about my main character. I started by using flashbacks to explain why she is the way she is and the flashbacks have taken on a story of their own. Here is the quandary. If I split the story I will have to focus on one or the other. Both storylines are not dependent on each other, but they support each. Am I the only one when is ready to scrap the entire thing and start over? I know this is the hard part. This is where the meat is put into the story. In all fiction books you get to the middle and this is where the magic swells into a whirlwind of words and emotion. The lover gets a heart broken, the hero fights the dragon and the detective finds the right clues. We must keep going. Reevaluate your outlines and plot structures but do not quit. Make the word count and clean it up in December. It will be fine and at the end you may even have a novel that is worth giving to the world. But wait! Isn’t life sort of like writing a book? We move through our days and we have goals and responsibilities that make us insecure. We put words on the pages of our loves. Sometimes it is a magical piece of prose and sometimes in is gibberish random thoughts that make no coherent sense. If we keep on living and keep on working to the end of the thing.Write to the end of the page. Make the goal the carrot on the stick that we follow, what would happen? We may be successful. We may end up happy. Imagine that? Happy people everywhere. Now if I can just take my own advice.